A triangular plaza at the heart of the Marrakesh medina, Djemma el Fna is the epicenter of Morocco’s most iconic tourist destination. 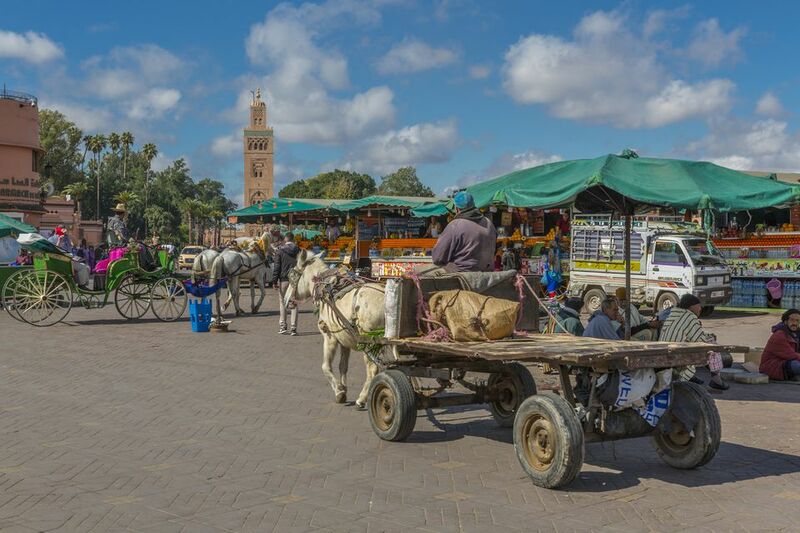 A gathering place for locals and tourists alike, the square has set the stage for cultural exchange in Marrakesh since the city’s foundation in the 11th century. It is bordered on one side by the souk, and on the others by terraced cafés, gardens and public buildings. From dawn to dusk, Djemma el Fna is a hive of activity. It is the place to people-watch, to sample authentic Moroccan street food and to fall under the spell of entertainers who have kept the crowds enthralled for centuries. The square was created along with the rest of Marrakesh’s historic medina by the Almoravids in the middle of the 11th century. Back then, the events that drew the largest crowds were the public executions that gave Djemma el Fna its name (which translates roughly from the Arabic for “the assembly of the dead”). Bards and poets also frequented the square, passing the country’s legends and traditions on to listening passersby via word of mouth. It is this tradition that earned Djemma el Fna a place on UNESCO’s list of spaces that preserve the “intangible cultural heritage of humanity” in 2008. In April 2011, the square’s Argana Café was the target of a terrorist attack, which claimed the lives of 17 people. Today, a subtle police presence works tirelessly to keep tourists and locals safe. By day, Djemma el Fna provides a scenic backdrop for traditional medicine peddlers, dentists and preachers. Entertainment comes in the form of henna artists and snake charmers, while young men posing for photographs with illegally kept Barbary macaques constitute the square’s darker side. These monkeys are the only primates other than humans found in Africa north of the Sahara Desert and are now endangered in the wild—a state of affairs perpetuated by the demand for them as pets and photo props. Later in the afternoon, the snake charmers make way for other performers, including magicians, acrobats, fortune-tellers and the storytellers whose ancestors made Djemma el Fna famous. Although the latter typically speak in Berber or Arabic, visitors can still get a sense of their prowess just by watching the reactions of their rapt audiences. If you find yourself in need of refreshment, pay a visit to the stalls that line the square for a glass of freshly squeezed orange juice. Water sellers also advertise their wares by clanging brass cups repeatedly together. Just before sunset, mule carts transport makeshift stalls to Djemma el Fna, so that their owners can transform it into a vast open-air restaurant. Shrouded in the smoke of countless grills and fragrant with the scent of sizzling meat and spices, this is the most atmospheric time to visit the square. By the time darkness settles, the communal tables are lit by naked light bulbs strung haphazardly from canvas ceilings and filled with patrons sitting cheek-by-jowl over plates piled high with exotic fare. Options range from typical tagines and grilled meats to more challenging local delicacies including snail soup and boiled sheep heads. The harmony of countless voices sharing the day’s gossip is complemented by a soundtrack of busking Berber musicians, Arabic folk groups and Gnaoua dance troupes. Because the atmosphere of the square changes continuously throughout the day, make sure to plan several visits at different times during your stay. Dusk is the perfect time to explore the permanent cafés located on the edge of Djemma el Fna. Head up to the rooftop terrace to sip alcohol-free sundowners while watching the spectacle of the food stalls being set up and listening to the haunting sound of the muezzin calling the faithful to prayer. Zeitoun Café is a particular favorite, boasting panoramic views of the action. When choosing a stall to dine at, pick one that’s full of locals: they known where the best food is being served. If you take photos of the street performers, be aware that most will ask for a tip. It’s a good idea to carry small change with you for this purpose and for paying for food (which is usually very cheap). In this way, you won’t have to pull out large bills that could attract the square’s numerous scam artists and pickpockets. Keep your cash in a zipped pocket or discreet money belt and leave any ostentatious jewelry at home. Similarly, be conscious of potential cons, including vendors giving “gifts” that they can later demand payment for and men seeking to exchange counterfeit currency.